Most SIT programs limit to students to traveling within the country they are studying. The reason for this is so students can focus on learning about that specific country and also so students can focus on their coursework as well since SIT is an academically rigorous program. This was never a problem in Tunisia and I never felt constrained. However, the program in Serbia is a bit unique. The program itself covers not only Serbia, but we also travel to Bosnia and Herzegovina and Kosovo. Additionally we have two travel weekends were we are able o travel to any country that was once part of Yugoslavia. Most of us decided to head to Slovenia since we won’t be visiting there during our program excursions and it is easily accessible by train. We left at Friday at 9:30pm. 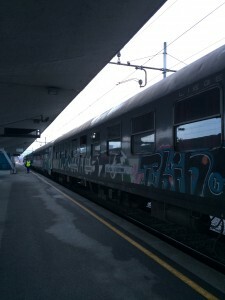 Our train to Ljubljana, the capital of Slovenia, was nine hours. We traveled through the north of Serbia and through Zagreb, Croatia and finally arrived in Ljubljana around 7:00am. My travel companions for the trip were Leah and Jeremy. Since, according to SIT rules, we had to back in Belgrade by Sunday night, we did not have much time to spend in Slovenia. Nevertheless, we were determined to make the most of it. We would have almost exactly 24 hours since we had to take the train home Sunday morning to be back by Sunday night. The night on the train had been long, but it was definitely an adventure. The train itself had seen better days but we were still able to get some sleep. 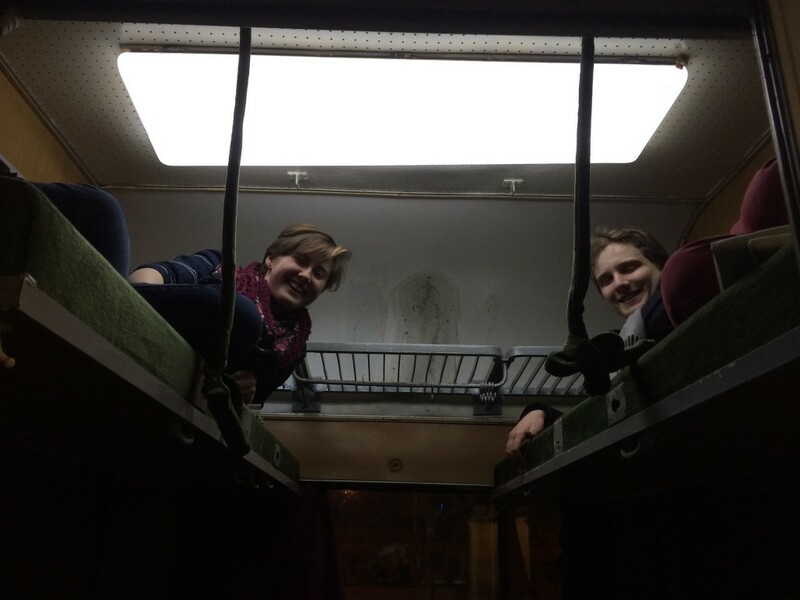 A few of my friends and I were in a sleeping car which mean the seats folded into beds. Though it was hard to get a consistent sleep since we were woken up what seemed like every few hours to have our passports checked. Thanks to the trip there and back I now have about eight new passport stamps. 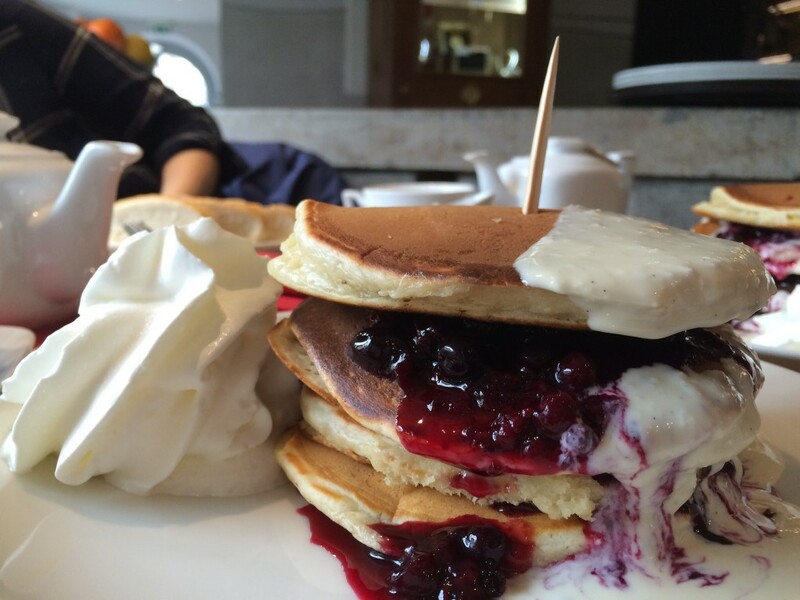 When we first arrived in Ljubljana our main priority was food. The only downside to this was that most places were still closed. It felt like a ghost town. As we made our way to the center of the city we passed only about four people. Ljubljana is a very small city with a population of about 280,000 so finding the town square was not hard. The river Jubljanica runs through the center of town and we walked along this snapping pictures while we waited for a cafe to open. Most cafes open at 8am so we didn’t have to wait long and we found a place along the river that looked fun and is called Makalonca. We were the only people in the restaurant when we first arrived and since we had only one day to explore the town we decided to sit and enjoy a nice breakfast and some tea. 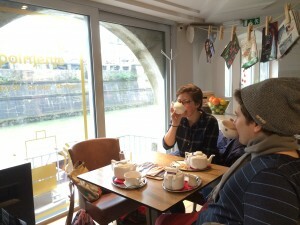 The kitchen didn’t even open until 9am but we were content to sit and chat while watching the river flow by. After our delicious breakfast we headed to the hostel to drop off our stuff. Check-in was not officially until three but we didn’t want to waste any time napping since we only had one day to explore. We packed as much as we could into one day. After leaving our stuff at the hostel we walked around the main square for a bit. One of the first things we noticed what that there were no cars in the old town. This is because eight years ago the center of the city became a pedestrian zone. This was part of an initiative to make the city more green. 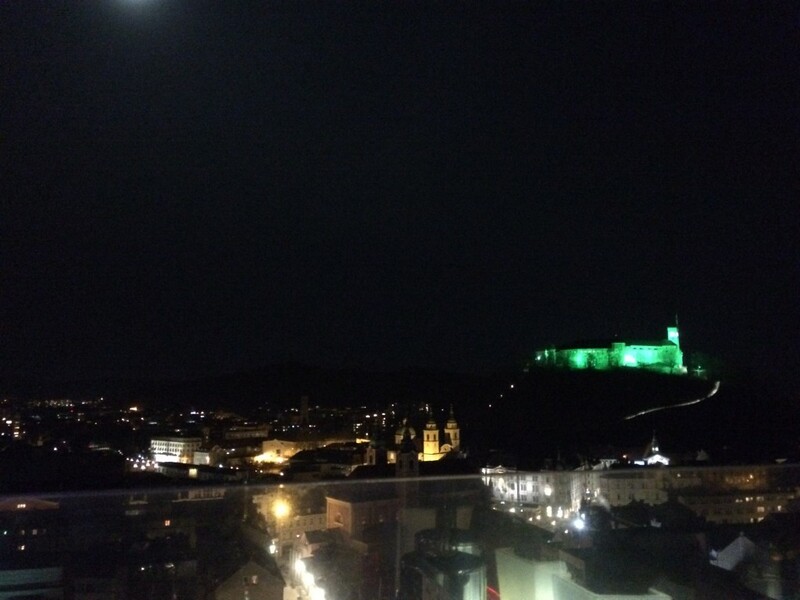 In fact, in 2016 Ljubljana was awarded the European Green Capital. Our itinerary started at 11:00am. Here is a list of how our day went. Almost every city in Europe offers a free walking tour. This is a great way to learn about the history of a place and see all the main sites. Our guide was great and it was interesting to hear about Slovenia’s role in Yugoslavia from the perspective of a Slovene. From the tour it seemed to us Yugoslavia was never a strong identity for most Slovenes. It is a period of history in their country but nothing more. Slovenia is certainly different from other former Yugoslavian countries. For example, they were the first to leave and the first to join the EU. They were also never part of the Ottoman Empire but remained part of the Austro-Hungarian empire so the architecture in the city was very different and reminded me of many other city in Austria and Belgium that I have visited. This was mentioned on our tour so we wanted to take a look inside. Unfortunately we could not enter the main reading room without a pass but it was a very beautiful building nonetheless. 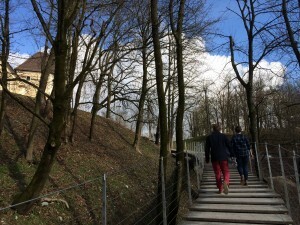 A castle built in the middle of the 15th century sits on the top of a hill in Ljubljana. We climbed up and admired the view for an hour. After hiking back down we ate lunch in the farmer’s market. I had a delicious spinach burek! Burek is dish that consist of a flaky dough filled with either meat, cheese, or vegetables and it is delicious. i had thought it was a Serbian dish but apparently it is also eaten in Slovenia. After lunch we went back to the hostel to officially check in. We also wanted to ask where the nearest grocery store was. We decided to visit the Ethnographic Museum. It was really interesting, despite the fact that not everything was translated into English, but in most cases the pictures were enough. What was interesting to me what that throughout the while museum there were only several references to Yugoslavia. Next we headed to what could be considered the only skyscraper in Ljubljana. The woman working at our hostel had recommended we come here for the view. We headed to the grocery store to pick up snacks for the train ride home. According to one of our Serbian friends, people used to bring entire chickens on long train rides! We didn’t think we would need that would much food so we bought some fruit and I bought another spinach burek. We went back tot he hostel to drop off the food and relx for a bit before dinner. We talked to some fellow travelers, a guy from Macedonia who was here skiing and two guys from Mexico studying in Zagreb. We found an Indian restaurant called Namaste almost around the corner from our hostel. It was very cold out so we didn’t have it in us to walk any further. The food was delicious though and we were glad we ate there, even if it wasn’t Slovenian food. We enjoyed a long dinner but were ready for sleep soon after. 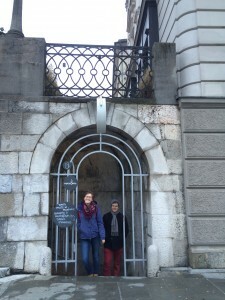 It had been a long day but we felt like we had gotten to see all of Ljubljana. We got up bright and early to catch our train. We boarded at 8:30 and spend almost the entire day on the train. It was nice to be able to watch the landscape got by and get a sense of what other parts of Slovenia, Croatia and Serbia look like. We finally arrived home to Belgrade and I have to say it really did feel like coming home.